A sewing business from home is a great way to use your creative talents to good use developing an online business to earn money from home. 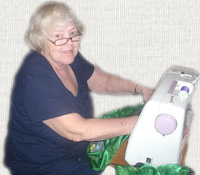 Back in 2007, my mom, Lynne Green, had a nice little sewing business going. She would make vestment sets and then list them on eBay. Sometimes she would sell them right away, and sometimes she wouldn't. But generally she would sell enough of her liturgical wears that she made a nice, part-time profit. But by a year later, the economy had taken a turn for the worse, and her sewing business dried up. That's when I suggested we start up an online business. We launched Everything Vestment in the Fall of 2008. Now, less than two years later at the time of this writing, we are selling twice as much as Mom has ever sold even during her best years of business. Plus, we're no longer at the mercy of our local economy because we're now reaching a global market. Mom's sewing business has been given a new life. The success of our sewing business from home is all thanks to a great little program called Site Build It! It's a powerful product with big goals and more tools than you can possibly imagine. It makes building a sewing business from home - or any online business - do-able. Thanks to SBI! 's all-in-one process, tools and guidance, anyone can build a business and succeed. With SBI!, you don't just build a website. Instead, you build a long-term, profitable e-business. Have you been leery of marketing your sewing business from home - or any other type of business - online for fear it would be too complicated? Fortunately, that's not a problem with SBI!. Many functions are completely automated, helping you to focus on your business. But better still, SBI! is the only product that takes the time to prepare you to build a profitable business, before you even start your site. Think much shorter learning curve with fewer errors. SBI! has an Action Guide that gives you step-by-step instructions that are both written and in a video format. All you have to do is follow the instructions. And creating pages for your website is as simple as riding a bike with its training wheels still attached. You won't need to know HTML (and in case you know what that is and like to use it, SBI! is compatible with popular HTML editors too). List-building and e-mail marketing are included with your SBI! subscription. Usually these expensive features are bought separately - not so with SBI! Visitors to your website can sign up for your e-zine; every time you mail them an issue, you are brining them back to your website - and bringing in more sales from your sewing business from home. Plus, SBI! provides automatic site blogging. You'll enjoy all the benefits of a blog without needing extra skills or additional software. If for some reason, SBI! isn't working for you, you can get your money back. It's risk-free decision that you can make with confidence and peace of mind. The SBI! private forums provide friendly, helpful support from other Site Build It! users. Help is available from folks who are in the same place as you. This peer-to-peer support gets you over the humps along the way in a stress-free environment. SBI! 's business-building support community is ready to help you succeed. The tortoise approach symbolizes Solo Build It! 's steady-and-sure approach. It's definitely not a get rich quick scheme. Instead, Solo Build It! keeps you from getting distracted by false promises or dead-end tools and strategies that end up costing more money. Slowly, confidently, you will build your sewing business from home to success. Watch the video below. Or, you can read all about it by clicking here.